Parkeology was always intended to be a place to talk about the truly hidden aspects of Walt Disney World. The ruins of theme park history lay scattered throughout the property. I would spend hours wandering past shuttered buildings, old props, and the lost vestiges of long-gone storytelling civilizations, reminiscing about the past and tracking down clues to these ancient secrets — not unlike a certain intrepid archeologist who performs stunts three times daily at Disney’s Hollywood Studios, not far from a little place called the Sunset Ranch Market. Somewhere along the way, Parkeology evolved into crazy interviews with sheep and impossible stunts of our own, which I suppose is the natural career progression of any archeologist. There are only so many pictures of a rotting River Country that I can post before it becomes tiresome. Great mysteries are hard to find. When I do stumble onto a new clue, it fills me with an incredible sense of wonder. The thrill of discovery outweighs the actual worth of the discovery itself. Such was my experience last week at Hollywood Studios when strolling down Sunset Boulevard. We have all the food you can want, as long as it’s fried. Recognize that? It’s the food court at Sunset Boulevard. A pizza place, burger joint, turkey leg shack, some sort of Froot stand. These things are a dime a dozen in theme parks (except for that weird “froot” thing. What is that strange food?) The name of the place is Sunset Ranch Market. We know this because there’s a sign. I wonder what this place is called? I have walked past this sign a hundred times. I have never paid it much mind. It just happened that on this day, I was in a Parkeology state of mind. So I stopped for a minute and took a picture of it. I don’t know why. I think I just liked the clean look of it. Black silhouette on white backing. It was a picture of a farm, which made sense because the name of the place was Sunset Ranch Market. I continued down the path to Tower of Terror. Fifteen minutes later, I was back again. That sign showed a cluster of buildings. It got me to thinking. It’s actually a picture of the food court area. This is not surprising or revealing in the least. The Ranch is clearly the backstory for the food court. One does not have to be a rocket scientist to figure out that the drawing was a loose depiction of the farm that once stood in the location. On a whim, I decided to test that theory a little bit. Note that in the sign, there is a large tower in the center of the picture, flanked by flagpoles. As it turns out, this is exactly what one sees if one stands at the sign and looks left. 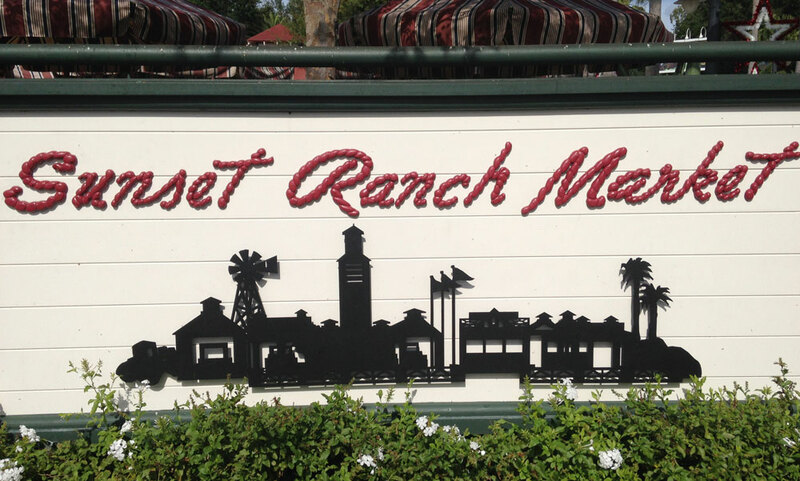 The Sunset Ranch Market sign depicts some garage like structures on the right. It turns out those match up with Catalina Eddie’s (pizza) and Rosie’s Fine-Grilled Gourmet Meat Patties. 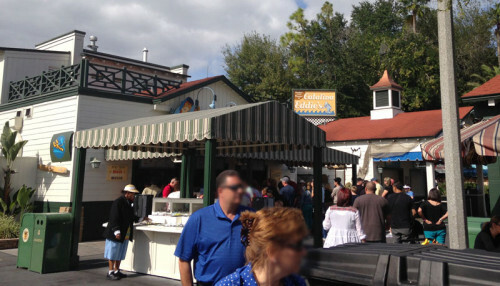 More buildings on the left side of the tower correspond to that Froot Stand and the Turkey Leg window, as seen in the first picture above. And there are even a few vintage trucks and things parked on the premises, just as shown in the sign. Again, I am not telling you anything surprising. You don’t even need to see the sign for the ranch theme to come through. If you’ve eaten at the Sunset Ranch Market more than once, you already have the idea. You also have indigestion, but that’s a different story altogether. At any rate, it’s nice that the sign is consistent. After I had proved all this out, I was feeling a certain amount of satisfaction, so I nodded at the sign (because I am in the habit of paying respect to inanimate planks of wood) and left to go visit the Animation Courtyard. Before I had even gotten to Villains in Vogue, I stopped and turned around. Something was still bothering me. Look at the sign again. What is the most obvious architectural feature? The buildings are all the same (squatty structures, square windows). The most noticeable landmark is that tower. And we already proved that one. But what’s the second-most noticeable landmark? If you answered “Windmill,” give yourself a gold star. Also, if you really do go through the effort of giving yourself a gold star, you may have a deep-seated need for validation. Seek psychological help. I took a step back, then crossed to the other side of Sunset Boulevard and surveyed the ranch. Tower, check. Buildings, check. Windmill… nada. Okay, I thought. Maybe it’s just artistic license. After all, there aren’t still tractors parked in the cashier’s window at the burger stand. And one doesn’t really expect all the palm trees to line up perfectly. But I’ve been a parkeologist long enough to wonder about such things. It struck me as entirely possible that there had once been a windmill on site, and maybe it had disappeared over time. 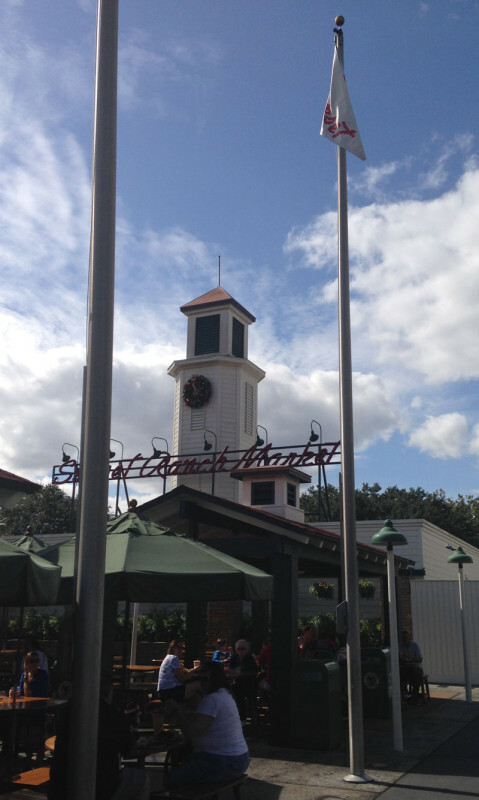 After all, that DVC building on the left in front of the turkey legs wasn’t there when Sunset Boulevard first opened. The landscape does change. So I wandered back through the seating area behind the Froot stand. I was met with nothing but a short retaining wall and thick vegetation. Nothing to see here, folks. I shrugged and was about to leave, but decided to take one more closer look. 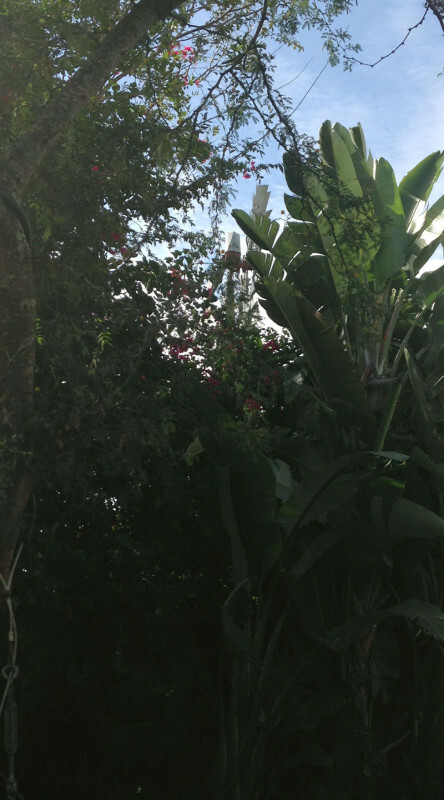 Behind the vegetation was a fence marking off the backstage area. The fence is yellowed with mold. It’s not really anything you would pay attention to. I didn’t see anything in this little landscaped patch that looked like an old base. All I saw was a lamp for lighting up the foliage at night. Then I looked up and peered through the thick branches. Even in the backstage area, where the windmill actually stands, the foliage appears to be swallowing up the structure. I’m not sure how old the satellite image is, but already you can see that it is not really visible from inside the seating area of the food court. You have to be looking for this thing to spot it. I assume that at one time, this thing was prominent on the horizon. But Sunset Ranch Market has been open for nearly 20 years now, and over time, the landscape has a way of burying everything (the same thing happened to the Rainforest Cafe). 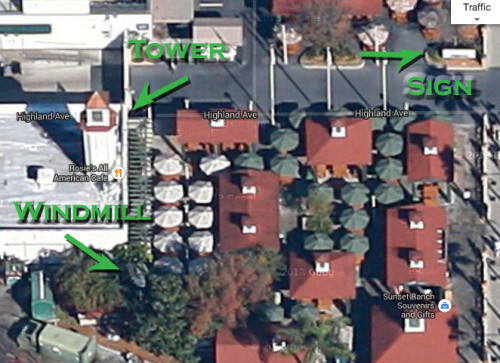 Anyway, that’s my little parkeological find for the week. I know it’s not like discovering Mr. Toad living under a bridge or the Lost City of Z, but I’m pretty proud of tracking that down just from a random glance at a sign. This entry was posted in Lost and Abandoned Disney Details and tagged Disney's Hollywood Studios, Sunset Boulevard, Sunset Ranch Market. Bookmark the permalink. Recent Discovery! Long-Lost Epcot Double-Decker Bus Found! I’m not sure how I just stumbled upon this old post, but I do happen to have a photo very clearly showing the windmill before it was overgrown! This was taken early one morning in 1999 from a catwalk high up on the front of the Tower of Terror (don’t ask). The trees still look pretty thick even then. Visible from the TOT catwalk, maybe. But ground level? Not sure. Btw, climbing all over that upper-story of TOT is pretty much at the top of my Disney bucket list. 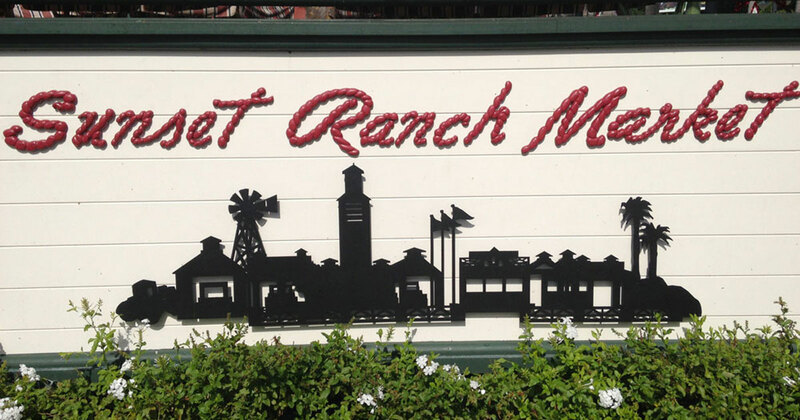 I hate to disprove the theory that the Sunset Ranch Market is based on a farm that used to reside there, however it is actually modeled after the Farmer’s Market in Los Angeles. I do love that you found all of the elements from the sign around the Market- how clever! that is a very cool discovery! Thanks, I was pretty proud of it myself! I can’t see it when I AM looking for it, and when I have a board-certified Doctor of Parkeology assuring me its there! Thanks for taking us along on your voyage of exploration, this really is an awesomely cool little post! Thanks Brian! I myself consider it to be among the most exciting works ever written about a windmill hidden by trees. If you buy the book, it deals at length with what lies beyond that door. Only $2.99 on Kindle! Okay, I’m lying. But I have recently had some thoughts of how to investigate more about that door. And I do have a theory that I have yet to prove out. Don’t you love it when I tease future posts on this subject? you better follow up on that, buddy! The next image of any quality at all isn’t until 2006, and it looks thoroughly green by that point. The poor windmill didn’t have a chance. The fact that you can even see a white blob in that picture, much less associate it with a windmill, means you undoubtedly have superpowers. Have you ever worn tights? That is impressive research, to be sure. 1995 was essentially the year Sunset Boulevard opened (I think it actually opened tail-end of ’94). I’m fascinated that it has been hidden at least 7 years already. 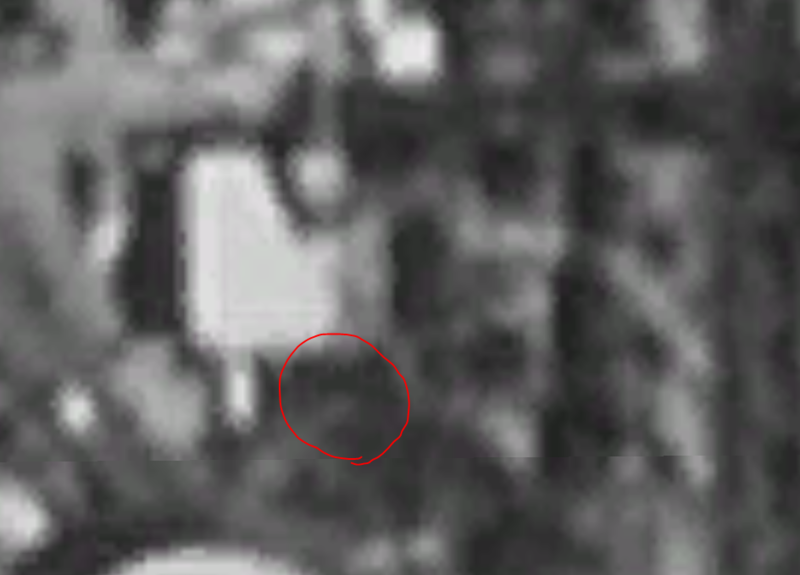 How long did it truly remain visible? Questions that may never be answered.